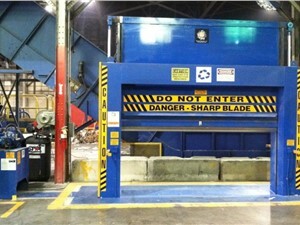 Hydraulic Guillotines used in plastics recycling operations are designed to assist the reclaim process when precutting is necessary. Precutting is required when a plastic product is too large or bulky or has been compressed to be fed into a traditional size reduction machines such as densifiers, granulators, or shredders. A hydraulic ram forces a large blade down onto the product splitting it into two sections at a time. This is an effective first step in recycling plastic purgings or rolls of plastics as well as bales of plastic. Arlington represents the new line of MGB guillotines in addition to the used guillotines listed below.